Common Names: Banded wobbegong, Ornate wobbegong (misidentification). 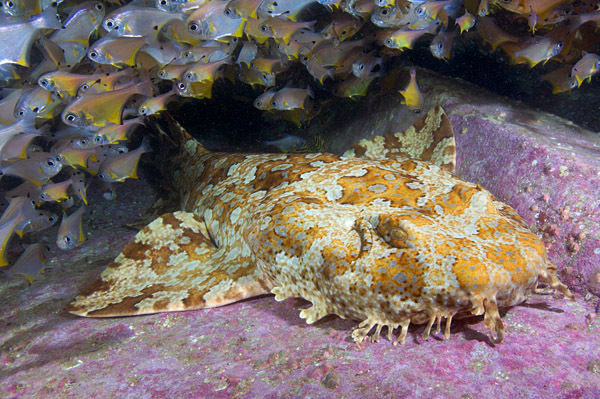 A large species of Wobbegong with no warty tubercles on head or body; four groups of dermal lobes (skin flaps) below and in front of eyes on each side of head; no dermal lobes on chin; nasal barbel closest to mouth branched; five to six lobes in second preorbital group (rarely four) with lobes at extremities usually longer and branched; broad branched postspiracular groups. Covered in an intricate pattern dominated by nine dark irregular saddles edged with black lines followed by grayish coloration. Light brown and gray freckle-like blotches between saddles.. Previously thought to be the adult form of the Ornate Wobbegong (O.ornatus), the Banded Wobbegong has recently been elevated to species status. Size: To at least 206cm. Habitat: Temperate rocky reefs and bays. Intertidal to 100m. Abundance and distribution: New South Wales to Western Australia. Behavior: An ambush predator. Remains motionless blending with reef structure until small fishes swim within striking range. Then, rapidly opens mouth sucking in its prey. Actively hunts at night for octopus, crabs, and other sharks. Photographs: Fish Rock, South West Rocks, NSW, Australia. Similar species: There are seven described species and a few undescribed species of wobbegongs. Most can be distinguished by barbell configuration and markings. 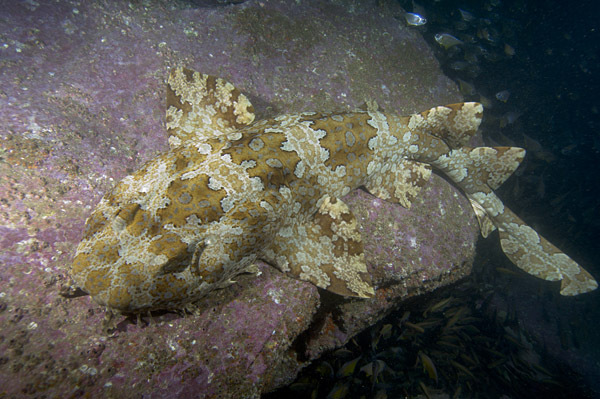 The closely related ornate wobbegong has unbranched post-spiracular dermal lobes. Orectolobus halei, which is regionally sympatric with S. tentaculatus, O. maculatus, O. wardi, O. hutchinsi, and two undescribed species of Orectolobus off WA, can be distinguished from these species by the combination of the number of dermal lobes, color pattern and the absence of tubercles. Orectolobus hutchinsi has slender unbranched postspiracular lobes (broad and branched in O. halei and O. maculatus) and a distinctive yellowish brown upper body coloration with well-defined, darker brown saddles containing paler markings that lacks whitish rings and blotches (unlike O. ornatus and O. maculatus) (Last et al., 2006). Sutorectus tentaculatus has large rounded tubercles on both the head and body, not present in the adults of other members of the family Orectolobidae. Orectolobus maculatus has six to ten dermal lobes, O. wardi has unbranched nasal barbels, whereas O. halei has five dermal lobes and branched nasal barbels. Orectolobus wardi has a simple color pattern with fewer dark spots, while O. maculatus and O. halei have a more elaborate pattern of variegated spots and saddles. Orectolobus maculatus has white Oshaped spots and white blotches that are absent in O. halei. Redescription of two species of wobbegongs (Chondrichthyes: Orectolobidae) with elevation of Orectolobus halei Whitley 1940 to species level. CHARLIE HUVENEERS 2006. Reaction to divers: Remains at rest relying on camouflage unless harassed. Has been reported to have bitten divers that got too close to its mouth even when not disturbed. 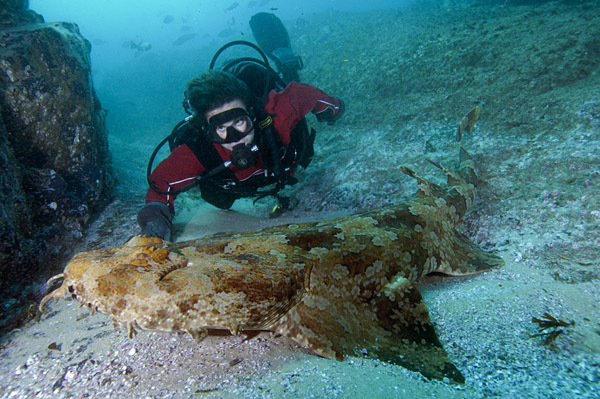 Diving logistics: The Banded Wobbegong is a commonly encountered species in New Sout Wales. One dive spot with an abundant population is Fish Rock. Fish Rock Dive in NSW organize daily trips out to this site. Grey Nurse Sharks, Ornate Wobbegongs and large Bull Rays may also be encountered. Reef Sharks and Rays of the World. Scott W. Michael. Sea Challengers. Sharks and Rays - Elasmobranch Guide of the World. Ralf M. Hennemann. IKAN.